Let’s talk about milk waste. One day years ago at my previous cafe, I was fed up with milk waste, and put a large plastic bin in the sink next to the espresso machine. I asked the baristas on each shift to pour all extra steamed milk into the bin. By the end of each shift we were shocked to see how much milk had been wasted. Each day we were wasting almost $15 USD of milk! That’s $5000 per year. It was a very busy cafe, but that was far too much waste. As a training tool, I asked the baristas to begin weighing milk when possible during slower shifts. Weighing milk was tedious, but it did help us zero in on the proper amount to pour. However, the benefits of these efforts tended to be short lived. Perhaps the simplest solution to this problem would be a milk jug with etched, graduated lines on the inside wall. 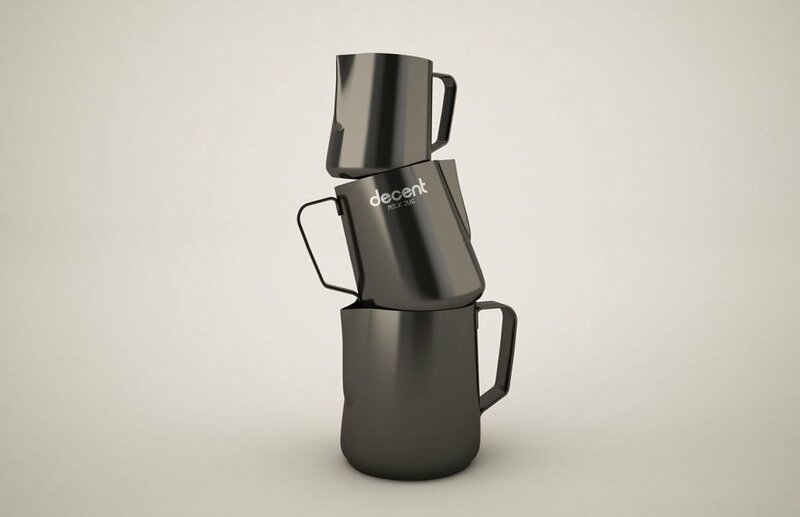 When John from Decent Espresso* showed me his first milk jug design, I said “I can’t believe no one has done that before!” John really, really likes it when I say that about any of his ideas. : ). The competition spout is not curved, and comes to a much finer point. This allows you to have extremely fine lines, as well as thick heavy ones. The competition spout gives you a variety of “pen widths” to draw with. The competition latte artists I co-designed that spout with all wanted straight and pointed. They preferred more control and thinner lines. However, it takes more skill to do basic designs with the competition spout. When I first switched, I didn’t like it at all. It took me about two weeks to get comfortable with it, and now I can’t stand going back! Please note that John is new to latte art (but improving rapidly), and he approached the spouts from the perspective of a relatively inexperienced barista. One hidden benefit of using just the right amount of milk is that it makes latte art easier to pour. When there is too much milk in the jug while pouring latte art, the barista is forced to hold the jug more upright. But the sooner she can get the tip of the jug nearly touching the surface of the drink during a pour, the more time and milk volume she can use to pour a design. This is why most baristas tilt the cup while pouring--it gets the tip of the jug closer to the surface of the drink, earlier in the pour. Having just the right amount of milk in the jug allows the barista to keep the spout very close to the drink surface for much of the pour. That makes successful latte art easier. I’m still learning how to steam milk consistently, and I use the measurement lines after steaming to see if I have done it the same as last time. It’s a great way to learn. There’s little point in starting with the "right" amount of milk if one creates way too much, or too little, froth. The measurement lines therefore decrease waste, increase frothing consistency, and make latte art easier. And if you own a cafe, they will save you a lot of money. Feel free to send me 1% of your savings :). *Full disclosure: I’ve helped design several of Decent’s products and receive a very small royalty on those products.